With almost 500 available titles that incorporate text, video, audio, quizzes, and other interactive elements, Lightbox offers a unique learning experience that engages learners with various learning styles. Each Lightbox title is available for multiple users with perpetual access, and comes with a print edition of the text as well. Follett has recently introduced a selection of elementary Spanish titles, as well as a selection of middle and high school titles. Quality and Effectiveness: Lightbox offers almost 500 interactive multimedia titles that can be easily and effectively incorporated into the classroom. The majority of the available titles focus on the elementary and intermediate level, although there are a few available for middle and high school, with more to come. Fifty-one of the elementary titles now have a Spanish version available, to support ELL and dual-language programs. Each title offers a variety of interactive features that may include text, audio, video, Google Maps, Web links, quizzes, AR quizzes, curricular alignments, and keywords. Most of the associated multimedia aspects of the titles are appropriate and add depth to the topic under investigation. The audio narration is machine-read text-to-speech, the embedded videos are high-definition, and the Web links lead to appropriate, high-quality content. The accompanying activities ask students to answer higher-level critical-thinking questions and can be downloaded for teachers to assess. 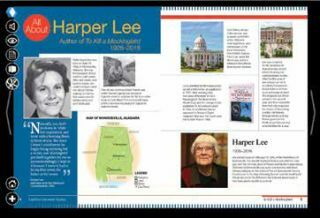 Ease of Use: Each Lightbox title comes with a print edition, as well as an electronic MARC record that can be loaded to the school’s library catalog. Students and teachers are able to access Lightbox titles in a number of ways, including IP authentication, unique codes on the print texts, and through digital content management systems such as Follett’s Destiny Library Manager or Destiny Discovery. The help guides are easy to follow, and no setup is required on the teacher’s part—no usernames, no passwords, and no accounts to manage. Creative Use of Technology: The Lightbox platform is Web-based and works in any browser; it also works on any tablet device with a viewing area of 7 inches or more. The overlay of interactive features on the Lightbox titles is a unique feature not always available with ebooks. In addition to the videos, slideshows, and Web links, definitions for keywords are available as pop-ups in the text to help students situate the meaning in context. The interactive and multimedia materials encourage students to explore beyond the written word and reinforce what is being presented in the text. Students are able to safely explore the Internet and other resources that are carefully selected and will enhance their knowledge and understanding. Suitability for Use in a School Environment: Lightbox makes it easy to differentiate learning as the titles offer a variety of media to meet the needs of more students. The titles available support existing curriculum in science and social studies and allow students to explore topics in a variety of ways. Lightbox focuses on interactivity and engagement by offering learning materials that appeal to more styles of learning than a typical print book. By providing students with a focused multimedia exploration of a topic, the platform helps strengthen not only reading, but also listening, skills. Lightbox is a great solution for schools and teachers looking to engage readers in multimedia experiences. Starting around $40 per title for print and multi-user perpetual access digital content, Lightbox offers a fantastic value compared with other ebook and digital-content products. • Interactive content engages learners on all levels, hitting a variety of learning styles. • Supplemental activities encourage students to think critically about the information presented. • Each title is aligned to national level standards.